The ECROS Technology AVR "ICE-Cube" is a high-quality but low-cost alternative to Atmel's JTAG ICE interface for AVR microcontrollers. Its design places a strong emphasis on dependability and no corners have been cut in power supply isolation and immunity from electromagnetic interference. Although affordable to the serious hobbyist, and despite its cute name, the AVR ICE-Cube is a professional-quality tool, well suited to use in a commercial setting. To reduce both cost and bench space, the AVR ICE-Cube has a unique mechanical design. All the electronics are squeezed onto a small printed circuit board less than 1.5 by 1 inches, barely larger than the passive connector of Atmel's JTAG ICE - about the size of an ice cube! The device "perches" on the target system's JTAG connector, requiring no bench space of its own. An attached shielded 6 foot cable runs to a DB9 for connection to the host system serial port. 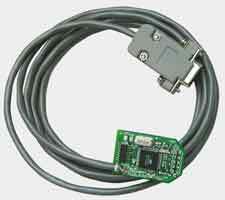 In case you prefer to work with your JTAG ICE interface to one side, an accessory cable adapter is available. Using this and a 10-pin ribbon cable you can place the AVR ICE-Cube on the bench and connect to your target system with the cable. Suitable cables are included by Atmel with the STK500 and are also available as accessories with the AVR ICE-Cube. 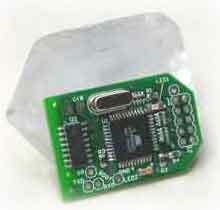 The ECROS Technology AVR ICE-Cube is presently out-of-stock. Please visit the Shipping pages for additional information if you do not wish to pay using PayPal.